Impeccably Decorated & Newly Updated. Steps from Main St with Private Hot Tub & Views. As soon as you enter Diamondtooth 4 Scarlet Dove your eye is immediately drawn back outdoors. Sure, the open floor plan in the living area means lots of room for hanging with those you love, and the kitchen equipped with stainless steel appliances is great for chefs of any skill level, but we’re willing to wager that you are going to find the real value of this property on the deck. 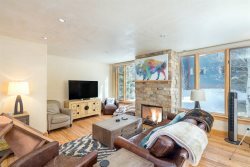 With huge mountain views of Ballard Peak and the ski area, every season adds a new dimension to this wonderful property. In the winter, sit outside in your private hot tub with a glass of wine as the snowflakes drift down gently from the sky. In the summer, enjoy the sounds of a fiddle or a mandolin drifting over from a festival in Town Park while you cook up something delicious on the grill. When you’ve had your fill of the great outdoors, head back inside where the fireplace beckons filling the living room with warmth as your favorite music plays through the Sonos sound system. Enjoy a meal with your nearest and dearest at the dining room table set for 8 people or find a steamy escape in one of two steam showers in the condo. Anytime is time well spent when you stay at Diamondtooth Scarlet Dove. This property has everything you need. Great location! Close to Gondola, restaurants, and next door to library. The condo has everything you need. We really enjoyed our stay here. We had stayed at this location before so we knew what to expect. Only comment this time was due to the weather it was very warm in the condo.